The focus of this article is on XML sitemaps, their installation and advantages for Joomla! websites. XML stands for Extensible Markup Language. This is the text format a sitemap is written in. Above all an XML sitemap is not made for the visitors or users of a website. It contains information for search engines and their bots which crawl the websites to index their pages and content. websites with many pages that are not linked among themselves. new websites with only a few or no backlinks. But even with a well structured website and a perfect XML sitemap there is no guarantee that every page will be registered. The bots decide themselves which pages are interesting and have enough high-quality content. According to that an XML sitemap can not replace other actions that are necessary for your seach engine optimization but it can help the bots to find all the interesting contents you provide on your Joomla! website. The file which contains the XML sitemap is usually called sitemap.xml. The following explanation describes how to add an XML Sitemap to your website using the Joomla! 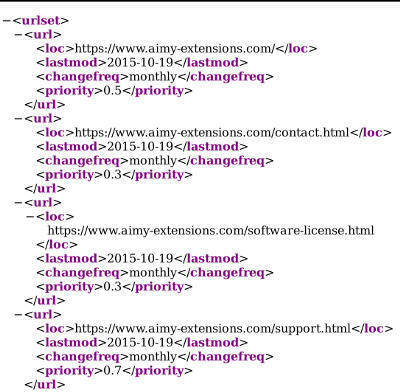 extension Aimy Sitemap. Download the component by following the link above. Install the extension on your Joomla! website as usual. Have a look at your new sitemap. Notify search engines about your new XML sitemap. In this article only the most important options will be explained. For further information and explanation you can read the user manual. Let's start having a look at the second tab. By deciding which priority a page has, keep in mind, that the priority only specifies the importance of the different pages within your website. Because of that it makes no sense to give every page a priority of 1.0. The data doesn't influence the ranking of your pages or give you an advantage compared to your competitors but it may help search engines to decide between two pages of your own website. Therefore it makes sense to give information which is based on facts so that your most significant and detailed page is chosen. At this particular point you first decide which priority all pages get by default. Later on after crawling your website you can set these values for more or less important pages of your website individually. Moreover you can tell search engines in which frequency changes on the website are usually made to let them know in which intervals they have to come back. Later on this value can also be defined individually for every URL. In the next tab ("Crawler") you can for example decide whether images should be included to your XML sitemap or not. The tab called "Notifier" allows you to decide if you want to inform the search engines Google and Bing about the new XML sitemap on your Joomla! website or not. You can choose to notify both, only one or none of them. Therefor choose "Component" from the main menu in the Joomla! backend again. 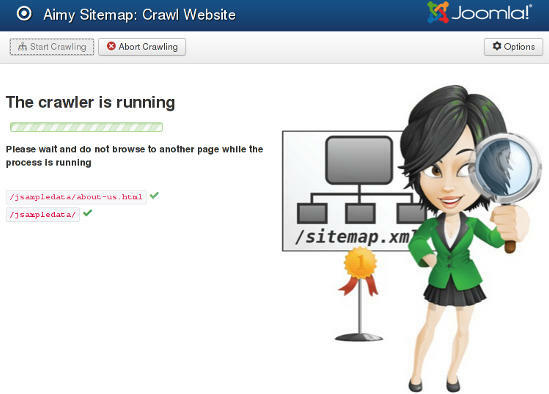 If you hover upon "Aimy Sitemap" a submenu will open where you can click on "Crawl Website". Depending on the size of your website the crawl will take some time. During this time you can see which URLs are found and currently processed. After crawling is completed you get a list of all added pages. 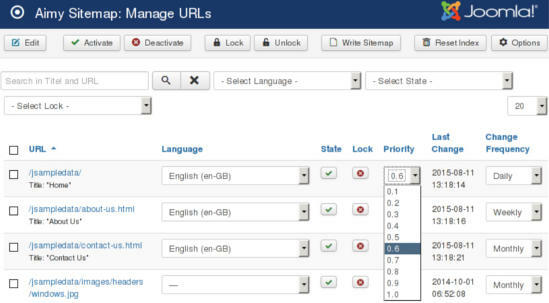 Now you have the possibility to manage the URLs of your sitemap by choosing "Manage Your Sitemap Now!". This button is located below the list of added URLs. Here you can make some modifications individually for special URLs for example deciding whether a URL should be included in the sitemap.xml file or not. Moreover you now have the possibility to determine the priority of single URLs. Remember to choose carefully which pages are most important. Lets have a look at a short example: Your website is a shop for books with a homepage, some pages for different genres, a privacy statement and a page with some information to get in contact with you. Of course every book has its own page to read the description, view the price and buy it. Obviously the privacy statement won't be the most important page of your website. An overview of the most popular books a genre includes or the pages of bestsellers many people search for may be the most important pages. One more important thing to mention: If you change the crawler's options as for example whether images should be included or not, you have to run the crawler one more time and write the sitemap again. Otherwise your changes won't be reflected by your actual XML sitemap. By notifying search engines you make them come to your website faster to recognize your new sitemap.xml and crawl your website again. This helps them to find pages they could not find before and to index them. Moreover they now know how important your pages are within your website and how often they can expect changes. Therefor choose again "Components" from the main menu in the Joomla! backend, hover upon "Aimy Sitemap" and click on "Notify Search Engines". Now you only have to click on "Start Notifying" and Google as well as Bing are notified if you set both up in the notifier's options. Watch our Video-Tutorial for further explanation about creating an HTML sitemap with our extension. Want to generate an XML sitemap for Joomla!? 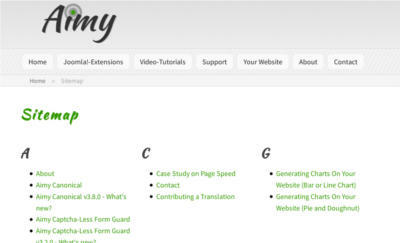 Have a look at the feature list of Aimy's sitemap extension!